You might say Andrew Wiggins is starting to take stock of things. That’s as in games with a steal and/or block, or in basketball parlance, stocks. The Minnesota Timberwolves forward has at least one “stock” in 15 consecutive games, his longest such streak since he had a 25-game streak in his rookie year, from Jan. 3-March 7, 2015. 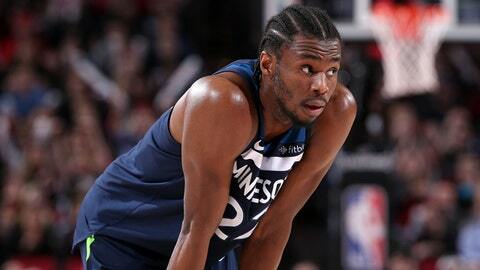 Wiggins’ streak began Feb. 25, when he had a block against Sacramento and has continued despite missing three games in early March due to a quadriceps injury. Since returning to the lineup, Wiggins has started to find his groove offensively, as well. He’s scored at least 20 points in seven consecutive games and is making 46.2% of his field-goal attempts in that span. Wiggins’ previous longest streak this season of 20+-point games was four, from Dec. 5-12. The current seven-game streak is also tied for the second-longest of his career. He also did it from March 30-April 9, 2017, while he reeled off 19 straight 20-point games Jan. 19-March 1, 2017. Wiggins has five games with at least 20 points against Dallas, Minnesota’s opponent Wednesday, but hasn’t done it since he had 23 on Nov. 4, 2017. However, he’s come close this season, with outings of 19 and 17 points. — Wolves rookie Josh Okogie has 34 dunks this season, many highlight-worthy. Among guards, Okogie is second in highest percentage of field goals being dunks, at 18.3%. Philadelphia’s Ben Simmons is first at 25.1%. Of course, Simmons is 6-foot-10 while Okogie stands just 6-4. If you’re wondering, the next three are Oklahoma City’s Terrance Ferguson (14.1%), the Lakers‘ Lonzo Ball (13.5%) and Chicago’s Zach LaVine (13.0%). — Minnesota has made 47.1% of its 3-point attempts against Dallas in their two matchups this season. The Mavericks have hit on just 34.1%, but are attempting 44.0 per game compared to the Wolves’ 25.5. — The Mavs have lost six straight home games to Western Conference opponents.